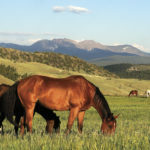 Ranch Sorting is one of, if not the fastest growing equine sport around the country, not to mention in our mountain area. 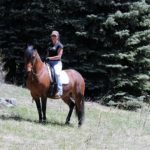 In true mountain folk tradition, a set of locals have started up their own ranch sorting group nicknamed ERSA, to enjoy this addictive and entertaining sport in our own backyard. Evolving from the need to separate cattle into different pens for tasks like doctoring, transport or branding, the sport of Ranch Sorting is done in two equal, fifty to sixty foot diameter pens that are connected in the middle with a twelve to sixteen foot opening. Eleven cattle, with large numbers on their sides are in one of the pens. Typically two riders (there are variations with one, two or three riders), enter the pen and as soon as they cross the opening/barrier between the two pens, the clock starts. The two riders must then work in harmony to move the cattle in numerical order from one pen to the other. The judge chooses the number that they start with and if they get one across the barrier out of numerical order, they are eliminated. The fastest time wins. There are different styles that Ranch Sorting teams utilize to sort the cattle. For example, some teams choose to have one rider stay at the gate and fend off the wrong numbers, while the other rider attempts to bring the correct cattle in the right order. ERSA teams take turns guarding the gate and sorting out the next number up to drive through to the other pen. This gives each rider a chance to do both positions and helps to level the playing field during competition. Friendly on the wallet compared to other Ranch Sorting gatherings and groups, ERSA is $150 per year to join and $20 per day for members or $45 per day for non-members. All of the money is used to care for the cattle and other expenses, as well as put on a Buckle Sort and barbeque at the end of the season, which starts the weekend after Evergreen Rodeo weekend and goes as long as the weather allows. Any shape or size of horse is welcome as well as families who want to enjoy the sport together. Pep and Jim Reffel have graciously offered their perfect place in Pine for ERSA to hold the Ranch Sorting’s. The ERSA officers include: Carl Heckendorf, President; Jerry Toman, Treasurer; and Linda Heckendorf, Secretary. The Board of Directors as well as fencers, haulers and cattle number-er’s aka wranglers of the group are Bruce and Laura McReynolds, Rex Eaves, John Orlando, Al Chidester, Harvey and Laura Penland, and Porter Bennett. Most importantly, Adam Shirley devotedly feeds and waters the cattle everyday to keep them happy, healthy and gaining weight for their owners! Thankfully, Carl Heckendorf’s connections with feedlot owners have kept the cattle price at a feed only basis. 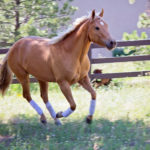 Tom Hushen has added a link to ERSA through www.evergreenrodeo.com. More information on Ranch Sorting can be found at the Ranch Sorting National Championships website, www.RSNC.us and through its sister discipline, the United States Team Penning Association, www.ustpa.com. Copyright 2013 Heather McWilliams, MtnHomes4Horses.com.